John Murphy defines Technical Analysis as “the study of market action, primarily through the use of charts, for the purpose of forecasting future price trends.” Market action refers to price, volume, and open interest data. While analysis of this data can't make absolute predictions about the future, studying the past price movements on a chart can help technical analysts anticipate what is “likely” to happen to prices going forward. Why Analyze Securities? What's the “best” way to invest? We discuss the three types of market analysts and how you can understand investment from a “big picture” perspective. Technical Analysis What is Technical Analysis? We explain what Technical Analysis is, how it works, and the general steps one should take when using technical charts and indicators to analyze stocks. Fundamental Analysis We look at the theory behind Fundamental Analysis and the general steps fundamental analysts take when evaluating stocks, concluding with a look at the strengths and weaknesses of the fundamental approach. Random Walk vs. Non-Random Walk Can you really outperform the market? We compare the Random-Walk Theory of financial markets and its counterpart, the Non-Random Walk Theory, while considering how these competing concepts impact Technical Analysis. Asset Allocation and Diversification What's the best way to minimize your risk while trading? We look at how asset allocation can be combined with technical analysis to ensure a strong trading portfolio. John Murphy's Ten Laws of Technical Trading John's famous ten (plus one) rules that everyone should know about charting and technical analysis. 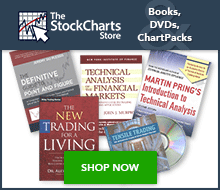 John Murphy's "Charting Made Easy" eBook An easy-to-read introduction to Technical Analysis written by John Murphy, covering all the basics in John's easily accessible style. Technical Analysis 101 A short course in the basic tenets of the field, designed to provide newcomers with a working background of technical analysis. Irrational Exuberance Describes the findings in Robert Shiller's behavioral finance book Irrational Exuberance, which looks at the cultural and psychological factors that influence the decision-making process when investing in stocks, using the 2000 stock market bubble as a case study. Cognitive Biases A look at eleven of the most powerful and common cognitive biases faced by both the average individual throughout daily life and investors in today's financial markets. Arthur Hill on Goals, Style and Strategy StockCharts contributor Arthur Hill discusses how to approach financial market investing and trading in a must-read article for all StockCharts users. Multicollinearity A look at how to avoid having two very similar signals on the same chart and the importance of doing so. "The Trader's Journal" by Gatis Roze A collection of short articles by a successful technical trader about his tools, his routines and the lessons he has learned throughout his years in the market. Bob Farrell's 10 Rules Wall Street veteran Bob Farrell of Merrill Lynch teaches investors to think outside the box with his 10 rules of investing. Donchian Trading Guidelines 20 trading guidelines developed by Richard Donchian, the father of trend following. Why and How To Use Correlation An explanation of why and how to use correlation to build a stronger, more diversified and stable portfolio.